Charlie Murphy (’18), M.O.L.I.F.E., Inc. I am a licensed rehabilitation counselor and am currently in the final year of my post-master’s degree. I am a licensed clinician and work as a therapist. I am also the president and founder of MOLIFE, Inc. I began this journey with my thesis for my first master’s degree to achieve an organization that supported people with disabilities to achieve their highest potential. Over the years it has evolved into three site locations in Fairhaven and a food pantry in downtown New Bedford with 65 employees. We have over 140 consumers we support on a weekly basis. 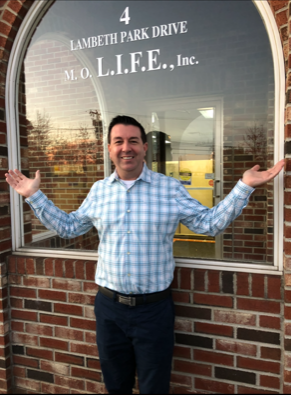 I am so proud of our growth and we are working towards even higher achievements at MOLIFE, Inc. as our mission and vision is to enhance lives. For the past 11 years, I’ve been a Selectman for the Town of Fairhaven, prior to which I was a member of the Board of Health for six years. I feel like I have to be fully immersed into my community. I am a Board Member for Southern Mass Credit Union, Chair of the Fairhaven Commission on Disabilities, the Fair Housing Coordinator for the Town of Fairhaven, a member in the Lagoa Friendship Society with Azores and Fairhaven, a member of the Sister City Committee for the pact with Japan and Fairhaven, a board member for Saint Joseph’s School in Fairhaven, a Parish Council member for Saint Mary’s Parish in Fairhaven, and an honorary Deputy Sheriff for Bristol County. I serve as a lector in my church and will soon be a member of the ACTS group, I am a member of the Our Lady of Angel’s Catholic Association and am in charge of the Malassadas Booth for the Annual Feast. I am also an actor and have been in several leadership groups for acting in Massachusetts and have appeared in some movies. I am in LOVE with my community and feel so blessed to be a part of such a great community! What motivates me to engage is seeing what each person I know and meet brings to the table. We are so blessed to have so many gifts and talents in our community and when I see this in each person I meet, it inspires me to do more and meet more people! What I valued most about the LSC experience is that I was able to learn SO MUCH MORE about the community that I thought I knew everything about. I was able to stop and see the beauty of the City of New Bedford and stop and pay attention to the art and talent and the beauty of Fall River. I have also been able to share this with MOLIFE; several of the people we support have already gone on walking tours and have been able to see the beauty of the community that we pass by each day. For my LSC community project, I worked on the Regeneration Committee for the Greater New Bedford area. I met incredible people and learned so many crucial facts that are keeping the city strong! I was able to work on a document designed to encourage businesses to come to the New Bedford Area because this community and the area communities are the best! I was also able to learn more about my fellow colleagues and WOW was I impressed. In fact, one of my colleagues, Tonya Johnson from Southcoast Health has become a board member for MOLIFE. This has all contributed to my community leadership through creating greater opportunities for people with different abilities to be the heroes in our community, which is my passion. If I had to describe my leadership in one word, I would have to say ENGAGEMENT! next post: Darcy Lee (’18), Samaritans FR/NB, Inc.